Below is an overview of the various services, etc. available to Wake Forest University students through the Deacon OneCard Office. These services can be accessed thru the Deacon OneCard Portal. Do not use the Microsoft Edge browser that comes with Windows 10 or Safari. These browsers are not compatible with the Deacon OneCard Portal. Please use Internet Explorer or Google Chrome instead. Also, please note that the portal may not be compatible with mobile devices. Your Deacon OneCard has your photo, name and University ID Number for use as an identification tool similar to state driver’s license or identification cards. It is your responsibility to carry your valid Deacon OneCard with you at all times. You must present your Deacon OneCard to any University official upon demand. During emergencies or special occasions, you may be required to have your Deacon OneCard visible at all times. All residence halls are locked twenty-four hours per day for your safety and security. For added safety and security, entries and alarms from the card access system may be monitored at the University Police office twenty-four hours a day. As an undergraduate student, a valid Deacon OneCard will allow access to all residence halls on campus from 7:00 AM until Midnight daily. From midnight until 7:00 AM daily, access will be limited to the residents of the particular residence hall or suite. 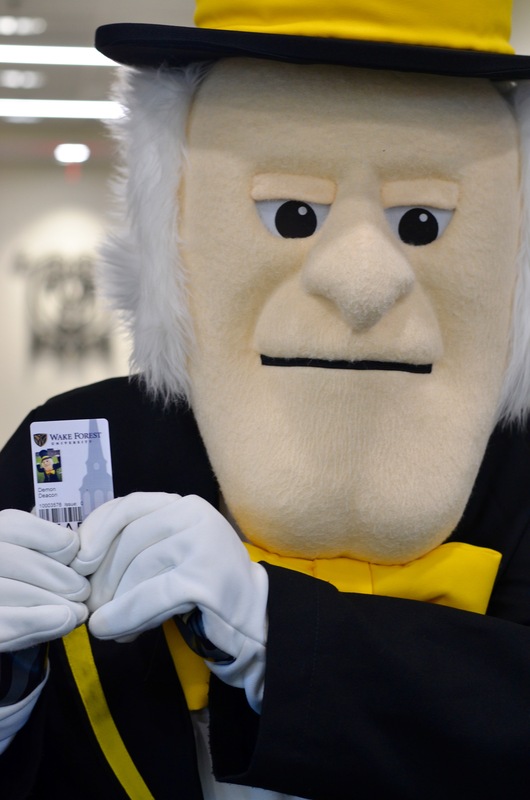 A valid Deacon OneCard will also allow you access to the Library for after-hours study (except during break periods), the Fitness Center during their business hours. During your tenure at Wake Forest University, you may be allowed card access to certain labs, classrooms or other areas on campus. Some approved University faculty and staff also have access to the residence halls during various hours of the day. If the card reader light is solid red, you will need to use your Deacon OneCard for access. After placing your Deacon OneCard on the reader, the light indicator will turn green and unlock the door briefly if access is allowed to that area. If the card reader light is green, the door is unlocked. If the light flashes red, access is not allowed. If the light flashes red and access to the area should be allowed or if the light continues to flash red, please contact the Deacon OneCard Office at 336.758.1949 or University Police at 336.758.5591 for assistance. you must go through Deacon Dining. The Deacon OneCard Office facilitates the use of the card for this purpose, but does not have access to your Deacon Dining account and the associated financial transactions. Your Deacon OneCard may be used at various locations on campus for events such as theatre performances, music recitals, concerts, art exhibits, movies, guest lectures, intramural sports, Student Union activities, Student Government elections and football games. Some events may also require a fee for entrance. Basketball tickets are handled through the Athletic Department Ticket Office, 336.758.5614 or 336.758.5613. Libraries on campus use the Deacon OneCard barcode as a means of identification for use of library materials including checking out items. You may also be required to show your Deacon OneCard upon entry at the library. If you are having issues with printing, please check with the library circulation desk to get assistance prior to coming to the Deacon OneCard Office. Access to Reynolds Gym is included with enrollment for all full-time undergraduate students. Graduate students have the option to join the Gym for a fee. All community members use their Deacon OneCard to gain access to Reynolds Gym. Please note, that if you get a replacement Deacon OneCard there may be an overnight delay in gym activation due to processes that take place between the two systems. Deacon OneCard replacements may be obtained from the Deacon OneCard Office, located in Angelou Hall – Suite 001. The office hours are 8:30 am until 5:00 pm, Monday through Friday. The office is closed during University Holidays. If you lose or break your card any time after hours or on weekends, please report to WFU Police Communications in Alumni Hall to receive a temporary replacement until our office is open again. This will accomplish three things: (1) you will have a way to use your meal plan; (2) you will have access to your residence hall; and, (3) it will deactivate your lost card so that it will reduce the possibility of it being used erroneously for access to our buildings and your meal plan. All enrolled students will obtain a new card. If this card is lost or broken, the replacement fee will be waived once for the duration of their enrollment. After the waive has been used, a charge of $35.00 will be billed to the student’s account for any replacements. New students are required to upload a photo prior to their arrival on campus, this allows the Deacon OneCard Office to pre-print new student cards. New students should receive their username and password through postal mail by mid-May. If you have not received this letter by mid-May, please contact the Information Systems Service Desk via email at help@wfu.edu or by calling 336.758.4357. Service desk hours can be found on the Service Desk website. Be advised that you may not be able to log in for up to 2 days after receiving your username and password credentials due to a technical issue. You will log into the link below to upload your photo to Deacon OneCard using your Wake Forest University username and password. If you are replacing a photo that already exists in the system, please be aware that it may take a few days to populate through to WIN. While your Deacon OneCard is used to access your meal plan, the Deacon OneCard Office cannot access the financial side of your card. To check balances, add food dollars, etc. you must contact Deacon Dining as described below. The frequently asked questions below should assist in common areas of concern, however for other questions in this area please contact Deacon Dining at 336.758.5607. How do I add Food Dollars to my Deacon OneCard? Money may be added to your Food Dollars at the Deacon Dining Office located in Reynolda Hall 012. Money may also be added using a Visa or MasterCard online via the Deacon Dining website. Can you tell me the balance on my Meal Plan or Food Dollars? Balances on your meal plan and/or Food Dollars can be checked by requesting a balance inquiry at any of the cash registers used by Deacon Dining. Balances can also be checked online via the Deacon Dining website. If I still have questions concerning my Meal Plan or Food Dollars, whom should I contact? Contact Deacon Dining at 336.758.5607 or visit their website. You are responsible for all transactions using your Deacon OneCard. Allowing others to use your Deacon OneCard is a prohibited as it violates University Policy to do so. To prevent unauthorized usage, report Deacon OneCards lost or stolen immediately to either the Deacon OneCard Office (336.758.1949) or University Police (336.758.5591). This will allow us to deactivate your Deacon OneCard. The Deacon OneCard Office, Deacon Dining, nor Wake Forest University will be liable for unauthorized use of your Deacon OneCard. You are responsible for ensuring your Deacon OneCard is kept in good working condition. With proper care and handling, your Deacon OneCard can last all years of study without replacements. Any function of the Deacon OneCard may be suspended at the request of an authorized University Official. Your Deacon OneCard remains the property of the University and must be surrendered upon departing or replacement. Report any issues with your Deacon OneCard via e-mail to deacononecard@wfu.edu. Do not carry your Deacon OneCard in a location prone to frequent flexing, such as a front pant pocket. This may cause unnecessary wear or damage to your card. Do not allow your Deacon OneCard to be laundered. Do not use your Deacon OneCard for any purpose other than one it is designed to do. My Deacon OneCard has been lost or stolen. What should I do? If during business hours, please notify the Deacon OneCard Office immediately at 336.758.1949 or by visiting us in Angelou Hall – Suite 001. After hours, please report lost or stolen Deacon OneCards to University Police immediately at 336.758.5591. I have lost my most recently issued Deacon OneCard, but I have a previously issued Deacon OneCard. Can I reactivate the older one? Unfortunately, we are unable to reactivate old issue Deacon OneCards. I have more than one Deacon OneCard with my information on it in my possession. Is that against any regulation? The University recommends having possession of only one Deacon OneCard with your information for your safety and security. Why does it cost so much to replace a Deacon OneCard? Isn’t it just a piece of plastic? When compiling the cost for replacing a Deacon OneCard, many factors must be considered including the costs of the equipment (hardware, cameras, software, printers), supplies (cards, ribbons), staff salary to cover the Deacon OneCard office, staff to process the Deacon OneCard updates and billing, etc. Your Deacon OneCard is a lot more than just a piece of plastic; there are several technologies on one card making it multi-functional. How do I obtain access to a lab or classroom using my Deacon OneCard? Access to a lab or classroom may be obtained by making a request to the contact person in the department where the reader is located. The contact person will then send an authorization request for the appropriate access. I found a Deacon OneCard belonging to someone else. What should I do with the card? A found Deacon OneCard should be turned in immediately to the Deacon OneCard Office in Angelou Hall – Suite 001 during regular business hours or to University Police – Alumni Hall after business hours. You may also send an e-mail including the name and nine digit ID number located on the front of the found card to deacononecard@wfu.edu to alert us. I am withdrawing from the University. What should I do with my Deacon OneCard? You may turn in your Deacon OneCard to the Deacon OneCard Office or to the Office of Academic Advising. My Deacon OneCard is expired and I am currently still a student, faculty or staff member. What should I do? Visit the Deacon OneCard Office, Angelou Hall – Suite 001, during regular business hours for a replacement. Bring your current Deacon OneCard with you to return. My Deacon OneCard has some incorrect information printed on it (name, date of birth, ID number, etc.). What should I do? If you are a student, the registrar should be notified of this error. If you are Faculty/Staff, you will need to contact HR. Once corrected in the appropriate system, it will automatically be corrected in ours. At that point, we can print a new card for you. I would like to place a hole in my card to put it on my key ring. Where is the best place to put the hole? Students should not place holes in their Deacon OneCards for any purpose. A hole in the card will weaken the card and will inhibit functionality. Card carrying cases and key chain type card holders may be purchased at the University Bookstores. If you require a hole in your Deacon OneCard for attaching to a key ring, etc. please stop by the Deacon OneCard Office in Angelou Hall as they can punch the hole without damage to the card. I have a friend who would like to obtain a Wake Forest University ID card to visit the University. How do I obtain one for him/her? Deacon OneCards are not issued to friends, alumni, or visitors. I have a friend who is a graduate student, how can I request access for him/her to my residence hall for visitation? Graduate level students do not have access to the residence halls.